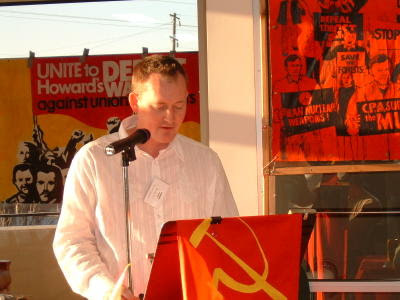 The Central Committee of the Communist Party of Australia has unanimously elected Dr Hannah Middleton as the new general secretary, following the death of Peter Symon in December last year. Dr Middleton, was previously CPA president for 16 years and is the first woman to lead the CPA in its nearly 90 year history. 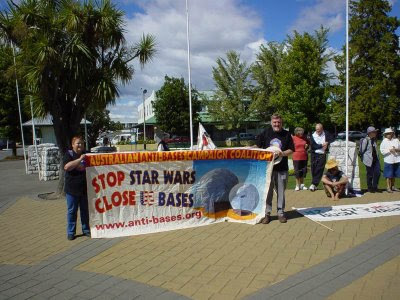 Hannah Middleton and her partner Dennis Doherty leads the Australian Anti-Bases Campaign Coalition, which for over 20 years has campaigned against US bases in Australia. The couple also works closely with NZ's Anti Bases Campaign. In January 2003 they both joined the protest against the US satellite tracking station at Waihopai, near Blenheim. Dr Middleton is convenor of the Sydney Peace and Justice Coalition and is director of the Blue Paper Project which lobbies against Australian military spending. Dr Middleton is also a board member of the communist influenced Global Network Against Weapons and Nuclear Power in Space. Denis Doherty, of the CPA's Port Jackson (Sydney) branch takes the new position of party organiser. Mr Doherty has been a leader of the New South Wales branch of the Catholic peace organisation, Pax Christi and with Middleton is active in promoting the "peace" message in Sydney secondary schools. Unions West Australia International Committee member and CFMEU organiser Vinicio (Vinnie) Molina is the new CPA president. Mr Molina moved to Australia from Guatemala in 1995 and is currently president of the West Australian branch of the Australia-Cuba Friendship Society. Warren Smith, Sydney Secretary of the Maritime Union of Australia is new Central Committee chairman. Hannah Middleton, Vinnie Molina, Warren Smith and and Melbourne based Guardian staffer Anna Pha (right) were elected to the CPA's ruling body the Central Committee Secretariat.